We have wide range of Floor Tile Adhesive , waterproof tile joint filler , waterproof tile adhesive , Tile Fixing Compound , Tile Fixing Material , Cement Tile Adhesive , Waterproof Tile Grout etc. 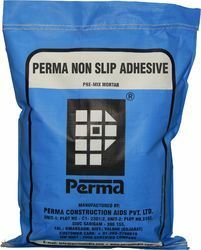 Perma Non Slip Adhesive is a cementitious polymer based material in powder form, which only needs on site addition of water to make a paste which is used for fixing tiles over existing mosaic tiles without removing them. 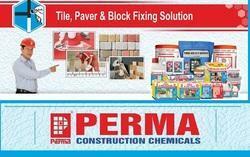 Perma Non Slip Adhesive is also used for fixing tiles on difficult surfaces. Perma Non Slip Adhesive is mainly used for fixing glazed, ceramic, terracotta tiles, vitreous tiles, marble and granite tiles on existing mosaic or ceramic floor tiles without removing them or hacking them. Perma Non Slip Adhesive is also used for tiling on difficult vertical cementitious surfaces and in cases where the weight of the tile is more than the normal ones. Ensure that the surface to be tiled is clean and free from dust, dirt, grease etc. Mix Perma Non Slip Adhesive with clean water in the proportion of 3.5 volumes of powder to 1 volume of water. Mix till a uniform consistency, smooth paste is obtained. Leave the paste for ten minutes in the pan for the entrapped air if any, to escape and remix the paste. Apply the paste uniformly on to the surface to be tiled as well as on the back of the tile and press the tiles in position. While using Perma Non Slip Adhesive wetting of the tiles or the surface to be tiled or curing is not required. Fill the tile joints with Perma C-Tone Filler after 24 hours of tile laying. We manufacture Universal Tile Adhesive in the brand name of PERMA which is good quality and export worthy. 1. Can be used for fixing tile over tile. 2. No need to break or hack the existing tiles. 3. No wetting of tiles required before fixing. 4. No wetting of surface to be tiled. 5. Makes the tiled area waterproof. 6. Holds the tile even at high temperatures. 7. Single component hence easy to use. Advantages Can be used for fixing tile over tile. Ceramic Tile Adhesives is highly demanded products in India. We are leading manufacturer of Ceramic Tile Adhesive & Ceramic Tile Mortar. Its a Adhesive for fixing Ceramic Tiles. Packaging Details: Perma Non Slip Adhesive is available in 10 Kg and 25 Kg multi-wall laminated sacks. 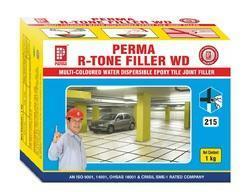 Perma RTF- WD is a three component product consisting of water dispersible epoxy base and reactor and filler. It only needs on site mixing of the three ingredients to get an uniform consistency smooth paste which is used for filling tile joints between stones marbles cut stones etc. Conventional cement based joint fillers are not strong enough, they have the tendency of promoting the growth of bacterial colonies and the epoxy based tile joint fillers do not satisfy the hygienic standards laid down by the food and the pharmaceutical industry. R Tone Filler -WD is available in Selected shades, giving an ample choice creating the desired pattern with matching or contrast shade of R Tone Filler -WD with the shade of tiles. We are Cemntitious Tile Joint Filler Manufacturer , Coloured Tile Joint Filler Manufacturer , Mosaics Tiles Joint Filler Manufacturer , Granite Joint Filler Manufacturer , Epoxy Based Waterproof Tile Joint Filler Manufacturer & Tile Jointing Material Manufacture in India. Perma R-Poxy is designed for use in floor tile, wall tile and stone joints for interiors as a jointing material and exterior application for joints width varying between 2 mm to 15 mm.The areas of application are for floor and wall tiles in:Bathroom and shower areas Kitchen counter tops Terrace and balconies Chemical plants Hospitals Refineries Garages Laboratories Warehouses Bakeries,Swimming pools etc. Perma Manufacture Polymer Based Thin Bed Waterproof Mortar For Laying Various Masonry Blocks. Looking for Tile Adhesive and Tile Joint Filler ?